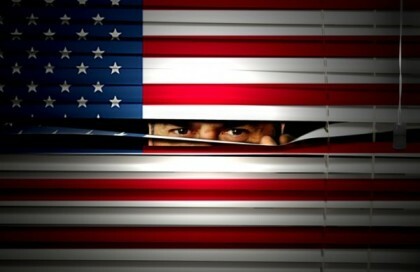 "Tell Congress: Repeal the PATRIOT Act!" Tell Congress: Repeal the PATRIOT Act! Introduced in the wake of the 9/11 crisis and passed in the name of "security," the Patriot Act empowers government to spy on Americans and confiscate their personal property despite the Fourth Amendment and it's protections on privacy. The USA PATRIOT Act must be repealed... and replaced with nothing. Introduced in the wake of the 9/11 crisis and passed in the name of “security,” the Patriot Act empowers government to spy on Americans and confiscate their personal property despite the Fourth Amendment and it’s protections on privacy. The good news is, Rep. Thomas Massie’s Surveillance State Repeal Act, if passed, would erase every single word of the PATRIOT Act and restore liberty as it was prior to 9/11/01. Act now and tell your U.S. House and Senate members to co-sponsor the Surveillance State Repeal Act and end the PATRIOT Act once and for all -- add your name below and proceed to deliver your no-cost letters to Congress. Throw this illegal and unconstitutional act out. This is a communist agenda. Margaret F. from Colfax, WA signed. Gary T. from Katy, TX signed. Scott B. from Fort Worth, TX signed. IMPEACH THE MORON POTUS NOWWWW!!!! Holly G. from Hillsboro, OR signed.